The Gowanus Lounge: Adventures in Marketing: Marketing Space in "Hip Gowanus"
Adventures in Marketing: Marketing Space in "Hip Gowanus"
This is an ad for space at the Sweater Factory in Gowanus that we found on Craigslist, where many listings have been posted recently. 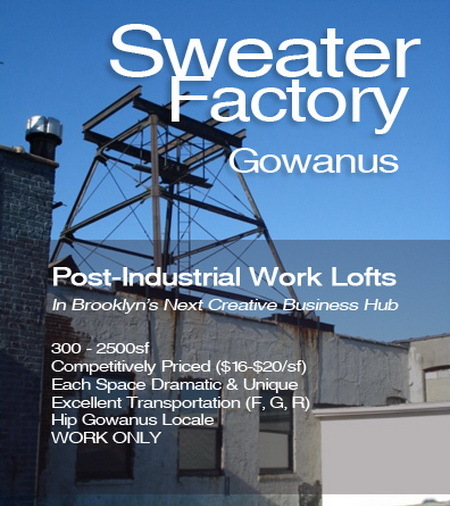 Were amused by how the loft space is marketed as being in a "hip Gowanus locale" and call Gowanus "Brooklyn's next creative business hub." Also we like the design of the ad. Another version of it is here. Where exactly is the “sweater factory”? Is it 505 Carroll Street? My mom worked there in the 1980s. Maybe they should call the placed “Sweatshop Building” would be a better name?